Cell design made a profound advance in 1995 when the pouch cell concept was developed. Rather than using an expensive metallic cylinder and glass-to-metal electrical feed-through to insulate the opposite polarity, the positive and negative plates are enclosed in flexible, heat-sealable foils. The electrical contacts consist of conductive foil tabs that are welded to the electrode and sealed to the pouch material. Figure 3-4 illustrates the pouch cell. The pouch cell concept allows tailoring to exact cell dimensions. It makes the most efficient use of available space and achieves a packaging efficiency of 90 to 95 percent, the highest among battery packs. Because of the absence of a metal can, the pouch pack has a lower weight. The main applications are mobile phones and military devices. No standardized pouch cells exist, but rather, each manufacturer builds to a special application. The pouch cell is exclusively used for Li-ion and Li-ion polymer chemistries. At the present time, it costs more to produce this cell architecture and its reliability has not been fully proven. In addition, the energy density and load current are slightly lower than that of conventional cell designs. The cycle life in everyday applications is not well documented but is, at present, less than that of the Li-ion system with conventional cell design. A critical issue with the pouch cell is the swelling that occurs when gas is generated during charging or discharging. Battery manufacturers insist that Li-ion or Polymer cells do not generate gas if properly formatted, are charged at the correct current and are kept within allotted voltage levels. When designing the protective housing for a pouch cell, some provision for swelling must be made. To alleviate the swelling issue when using multiple cells, it is best not to stack pouch cells, but lay them side by side. Figure 3-4: The pouch cell. 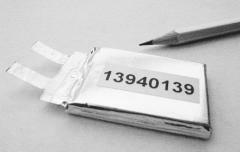 The pouch cell offers a simple, flexible and lightweight solution to battery design. This new concept has not yet fully matured and the manufacturing costs are still high. The pouch cell is highly sensitive to twisting. Point pressure must also be avoided. The protective housing must be designed to protect the cell from mechanical stress.